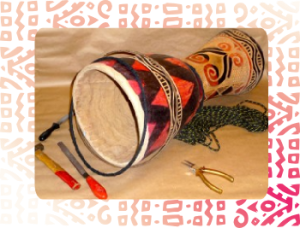 African drums such as the djembe and dundun, Cuban drums and shamanic drums have a drum-head made of skin that gets used over time and beats. Sometimes it happens that the drum-head is broken and must be replaced. If you have a drum that needs fixing or tuning, do not hesitate to contact me, I’ll fix it with love.